The head of a drugs gang who spent months on the run after skipping bail has been jailed for nine years and eight months. Sonny Elms, 25, and his associates flooded Scarborough with heroin and cocaine between 2013 and 2014. Elms, of Mansfield Avenue, Manchester, pleaded guilty to conspiracy to supply class A drugs in April 2016 but failed to turn up to be sentenced in February. 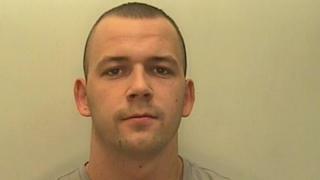 He was arrested in July and sentenced at at York Crown Court earlier. Elms was sentenced to eight years and eight months for the drugs offences and ordered to serve a further 12-months for failing to surrender. Five members of the gang were jailed in February for between six years and three months and 18 months after admitting drugs offences. Det Sgt Ryan Chapman said: "This gang looked to target vulnerable people in Scarborough without any care for the damage drugs cause. "Elms seemed to think that he would disappear from our radar if he didn't attend court. But it doesn't work like that." A seventh man, 26-year-old Paul Heaton, from Manchester, remains at large after absconding before sentencing.